I recently watched Charlie Varrick and loved it! I was a little disturbed that his wife was willing to kill for what they thought was going to be only a couple thousand dollars, but Matthau plays Varrick wonderfully. Robert: Yeah, this is a mostly-undiscovered little gem. Matthau shines, and it was great to see him outside of his "comfort zone" (though he has done some dramatic work in the past, his comedy performances far outweigh them). I'm glad you reviewed this. It's always been one of my favorite crime flicks. I'd recommend another Matthau crime film in The Taking of Pelham One Two Three. 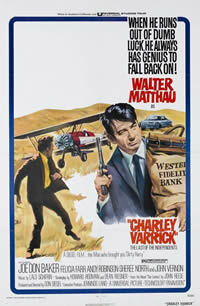 And, of course, Matthau isn't humorous in Charade. This is a great movie! And it's one I'd never even heard of until I accidentally stumbled upon it one day while bored and surfing the TV stations looking for a film to watch. People have forgotten that Matthau could turn in a truly impressive performance (because, I think, he trended toward pop comedy roles).